Stump Woods: "Big history, this club, mate, oh yeah... 32 flags." Now this is how you do feel-good. Aunty's had a couple of stabs at it this year but with Valentine's Day we finally arrive: gorgeous family drama that's funny, whimsical, warm-hearted and feels absolutely real. Rhys Muldoon is fab as Ben Valentine, the drifter manoeuvred into coaching a small town's footy team, but he's ably supported by a great cast of familiar and not-so-familiar faces. The equally fabulous Peter Temple provided the script, which snaps and sparkles. Peter Duncan (Children of the Revolution, Unfinished Sky) directs. The result is a package that perfectly captures small-town Australian life and the strange magic of Aussie rules football. There are too many highlights to list them all, but the choreography of the first footy match is worth a special mention. Gorgeous - a hideous word. Valentine's Day was OK. Not great, but easy enough to watch. It was certainly a far sight better than the dreary East of Everywhere and the cliché-laden quirk-by-numbers that was Bed of Roses. If you happen to stumble across it on ABC2, Foxtel or via an ABC1 repeat, give it a lash. You knew there'd be a but. Footy details. I'm a stickler for details, and only a little bit obsessed. The review above, and a few others I've read, not to mention Rhys Muldoon on an ABC Conversation Hour last week, referred to the show as "a package that perfectly captures small-town Australian life and the strange magic of Aussie rules football." In essence, maybe; in reality, maybe not. While passing through the town, Ben Valentine (Muldoon) finds himself on the wrong end of the law, but when the judge hears he has a sports background, he is given community service: to coach the local footy team, the Growlers. Ben has been arrested, but while he's in jail the magistrate hears his name, puts two and two together, gets twenty-two, and assumes the Ben Valentine in his lock-up is the same Ben Valentine who once played "20 odd" games for "the Tigers". (The real nickname of the real Rushworth is the Tigers. Really.) It's never stated precisely which Tigers, but since Ben is referred to as "having played with the best", it's pretty obvious the writer's inference was that Ben played in the AFL for Richmond. The magistrate, who doubles as the big nob at the local footy club, then fixes the sentence so that Ben, instead of going to jail, has to do 200 hours community service coaching the local Rushworth Bears. Valentine's Day is based on a plot of mistaken identity. A drifter, thought to be an ex-league footballer, ends up coaching a team in Victoria... and no-one realises. No-one in a Victorian town spots that the Ben Valentine who now coaches their footy team is not the same Ben Valentine who once played "20 odd for the Tigers". On the other hand, the townsfolk DO recognise Tony Cosgrove, captain of the Tigers who comes to watch one of the Bears' games and who the real Ben Valentine had a fight with at the Tigers; a fact which popped up as No.2 on Google when a local lawyer - a hottie, naturally - does a search for Ben. The Bears get blanket coverage on the local radio station. Now, I've played a lot of country footy in a lot of country towns and while there is certainly a call of the game on the local radio station, there is not much else; certainly not ear-to-ear talk-back. Smokers are fake. Bet that's news! Fake smoking applies to so many television shows and movies, it's ridiculous. Surely it's well past time the makers of TV shows stopped trying to convince us their characters enjoy a gasper when quite obviously they would rather lick trees. Virtually none do the drawback, and most look about as convincing as a ten year old "smoking" a musk stick. When is the last time any of you rocked into a small country town, rolled into the pub, and the local band didn't give you a headache? Mel, a woman who is one of the biggest fans of the club, plays in a local band - that is not bad. Not that I've already been on the internet hunting down the soundtrack - although they do a reasonable version of the Sunnyboys' Alone With You - but it would have been much more realistic had the band been rubbish. Mel also makes a footy mistake. The Bears need to win three out of the last four games to stay alive as a club in their own right or else they will be forced to merge with Lucan. Mel: "We need six more competition points. We gotta win three from four." Ignoring, with great restraint, the "three from four", a creeping Americanism that makes me mad, correct me if I'm wrong: the Kyabram District Football League have four points for a win. That would mean Rushworth only need to win two games. Maybe the writer, Peter Temple, is from a rugby league state; or maybe he is even from the bizarro world we call South Australia, home of two-point wins, one-point draws, and strange percentages. Pretty much every time sport is featured in a film or on a TV show the people playing are crap. Complete scrubbers. Valentine's Day is no exception. Rushworth are awful, and I don't know why the choreography needs a special mention; unless it's a special mention, if you know what I mean. But that doesn't stop them beating arch rival Lucan in the last match, despite the Lucan players actually being able to play. They kick properly, hit targets, mark on the lead; they are proper, grown-up footballers. Rushworth looked like a bad Under 14 side made up entirely of unco fat kids. Nor have I ever seen a player and/or coach walk down a street of a country town as everyone, not just the odd passer-by, cheers him, pats him on the back, and treats him like a rock star. 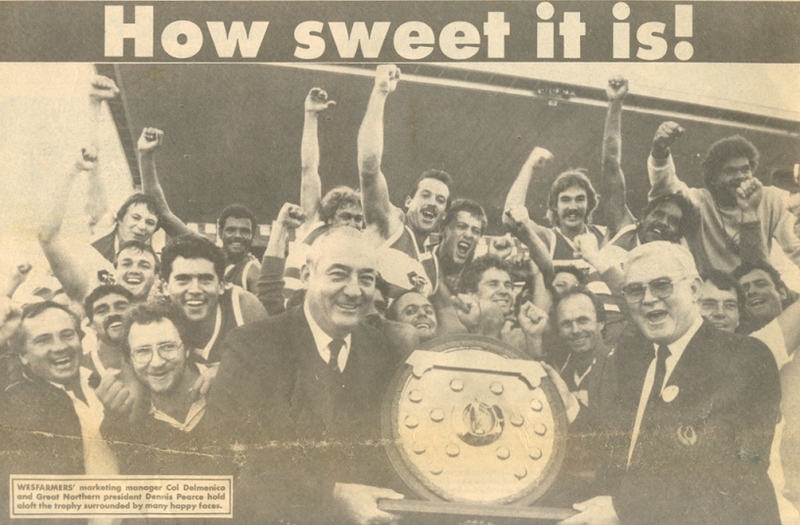 After the Great Northern Football League won the 1987 Westfarmers Championships First Division, smashing the South West 28.8.176 to 7.4.46 and I had my picture in the Guardian - the Geraldton Guardian - no crowds parted as I strode up the street. The mum of one of the guys I played with said "good win" in Coles. That 'ed be Tones and Simsy wouldn't it? What's the difference between a "dynamic" forward and a normal forward? 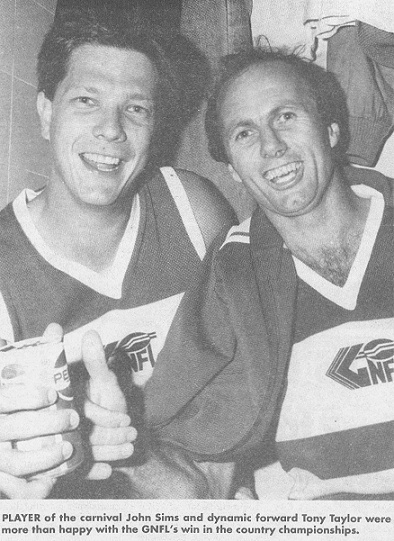 That would be Tayles and Simmsy. Normal forwards don't jail left-foot bananas from fifty on the boundary with their eyes closed. I used to be partial to a bit of "local" drama on our ABC but that was back when the Sporting Globe was pink. I saw that Valentine boosterism around but was disinclined to look at something about football. And country towns. And men in country towns. Seeing I've spent the best part of a liftetime trying to put a Copenhagen-style lane between me and me quaint country town early years. Well not a town really more like 20ks out into the bush but the town was the big smoke and about as healthy and vibrant as second hand smoke in a smoko shed on a winters day. Anyway until now - thanks tayles - I didn't know it was writ by P Temple. Broken Shore is the GAN. Push up on the couch tayles, toss us the remote mate, shush the kids - I'm watchin' Valentine or whatever its called. Pepsi. The choice of a new generation???? Good to see you dropped the hard stuff Tayles. Pavlovian conditioning has made ABC TV on Sunday nights a no go zone, and the Aussie rules theme would be a turnoff for many -- me included. I had the misfortune to watch City Homicide, though, and it is an absolute shocker. Noni Hazlehust probably has to pay bills like the rest of us, but it's a pity she's doing it in this series, surrounded by atrocious acting, dud directing, egregious editing, ludicrous lighting, shameful sound recording, inept incidental music, crap costumes, silly sets and senseless scriptwriting. I believe the series has used police consultants, but a drama coach would have been a higher priority. The worst Aussie show I have seen since The Librarians. oh Professor: not smart enough to avoid anything with NoNo Noni in it. The merest glimpse of her gurgly effervescence makes me ill. Her ex, however, was pretty damn good in The Great McCarthy. Bed of Roses was shite because Heather Jelly wasn't in it. I enjoyed Shirley's brother Ben Valentine because Muldoon and the Magistrate stirred fond memory of Grass Roots, and because I thought the local band was shite. Re suspension of disbelief: a great deal of it is also required to enjoy Hollywood's major productions by zillion-dollar directors and screenwriters. Tayles, you may be a curmudgeonly obsessive, but you'll always be a Dynamic Forward for me. (and you haven't changed a bit). FX: With you on the "Valentine boosterism"; there was a shedload of that on the ABC over recent weeks. Not that boosterism is restricted to just V-Day. Aunty has an rude habit of boosting all their shows on both rayjo, net and the telly. Yes - fully aware of commercial network advertising. But Aunty do it in a "we think we're better than them" way which smacks of smug. Convos on the Convo Hour, interviews on Faine and equivalent stations interstate, chums... sorry, friends of the ABC at Fairfax. Then they try to pretend it's not really advertising, when really it's plug-city. Don't think I'm as down on the country as you. I work in an industry that is based wholely and solely in Melb, but if someone said "We are moving to Taralgon, as you prepared to move there?" I would say "Yeah, no worries." 2Bar: And the choice of a previous generation. Although, not mine. For some reason - sponsorhip contra, probably - we only had Pepsi. Mind you, at least when you have Pepsi, not Coke, you are spared the hideousness of Fanta when you feel like an orange. Prof: Is CH as bad as CR? Or Canal Road, as Nine called it despite that being a very American term, not even slightly likely to be used on the canals and roads of Melbourne. Push-up time! Drop and give me acty! Dys: Whenever I see the magistrate, I think of those Roo-Boy ads for North Melbourne. And I agree with the suspension of belief and thought VD was almost good enough in other departments to almost cover for the SoB factor. Almost. Like I said, it was OK. Excluding the footy faux pas, there were other false notes. But the... ahem, excuse the vernacular: fat chick from The Wedge made me laugh. I'm now a Lethargic Froward. I might have to have a look then chrisl. I umpired a few games at Mt Evelyn and nearly did my ankle and/or knee a few times when they were trying to install some drainage. I think Peter Thomson based the 15th green at Moonah Links on the Mt Evelyn oval with its many slopes, undulations and drop-offs. Tony T, I've never seen Far Canal Road, so can't compare and contrast. Dysthymia, I don't mind Noni -- perhaps a hangover from Playschool days, but definitely not a hangover from her beastly home renovating days. Your teeth are much better than Simmsy's. See, that's the difference between being "Player of the Carnival" and a mere "dynamic forward". It's all in the teeth. Whenever anyone tells me that so and sos a good upcoming future talent I always respond "Show me his teeth and let me be the judge of that!". I also coined the phrase "Show me the boy's teeth at 7 and I'll give you a written report on his future football potential. At a fee. And with Management rights." Feel free to use it. The Growlers? Are you serious? HAHAHAHAHAHAHAHAHA!!!!! Ribald doesn't even come CLOSE to it. The writers might be Victorian, South Australian or rugby league playing, they sure as hell didn't go to Sydney Uni in the 90's, because that meant something something entirely, shall we say, LEWD. An entire team of growlers.... tee hee! Maybe they did, and are dining out on their own in-joke as we speak? I served out my senior years of high school in Traralgon. That town is one of the reasons I am down on the country. Well, that part of the country anyway. You can't hold much love for a place that has, as its best feature, that it is slightly better than Morwell, which is, in turn, somewhat marginally better than Moe. Its second best feature is that it is well positioned if you want to go somewhere other than Traralgon. I'll be spending the weekend in Mirboo Nth. The in-laws live there. It has a really nice golf course so I can escape the house for most of the time I'm forced to endure the place. You looked heaps better when you were on the booze Teach. Russ - you'll notice that our dynamic forward tayles has now talked of Taral-Gon here and above. Clearly its a much more desirable place than Tra-Ral-Gon. Taralgon is a wonderful place Francis, because its a place one only ever passes through, perhaps stopping at a nice bakery for lunch, on the way to the lakes, or mountains. Only those unfortunate enough to have to write it on a form have ever been to Traralgon, with all its undesirabilities. Carrot: The full version of the tidy, if ribald, sight-gag. ~~ What's so special about Tralgon? ~~ Well, obviously, this is not meant to be taken literally. It refers to any Victorian country town. russ - yes. As I see it theres a mythical Taral-Gon for every Tra-Ral-Gon. Traralgon is where people live and fill in forms and go to school. Where coffee may be made hot by a machine but the basic ingredient is Pablo Instant. Slow food is when you have to wait more than 5 minutes in line for greasy chips with gravy eaten on the way home from school. Where the guy next door does wheelies everytime he comes and goes and thats about 6 times a night. He also keeps at least one half starved pig dog who whines and barks whenever hes away and snarls and growls at neighbours when hes there. Taral-Gon on the other hand is only ever experience by city people who drive up on a long weekend or on the once a year trip from head office to the branches. This place has a quaint organic bakery owned by starry eyed tree changers spending there super where they grow their own gluten free wheat and lovingly bake it into "slow food", the cafe where you have your coffee has managed to scare off any trackie dack (s)wearing locals with snotty nosed kids yelling at the defacto while they light up a winnie inside the shop as the pig dog attempts to eat a drunken grannie on a zimmer frame staggering out of the local tab/pokies pub. Yes theres always two country towns side by side. Mythology for visitors and Reality for those stuck there. Did you at least score a free crate of the sponsor's product for being seen drinking it in the paper? FX: Your Taral-Gon is more like Dayles-Ford. 1.0: Only thing I got was beaten up by a couple of blokes in the car-park after. Wrong place, wrong time; caught in the cross-fire of a domestic dispute. I went to school in Mirboo North, it was the big smoke to me. Apparently they turned the milk factory into a brewery. Won't somebody think about the children?